What is a Medicare Part D plan? Question: What is a Medicare Part D plan? (3) you and your insurance then each share a portion of the coverage costs (for example, your plan pays 75% of retail drug prices and you pay the 25% balance). How do you get Medicare Part D prescription drug coverage? A Medicare Advantage plan that includes prescription coverage (MAPD) - an MAPD includes your Medicare Part D prescription drug coverage - plus includes Medicare Part A coverage (for in-patient and hospital care) - plus Medicare Part B coverage (for out-patient and physician care) - and often other benefits such as basic dental coverage, optical coverage, hearing aid coverage, and fitness coverage - all for one monthly premium. Medicare Advantage plans are also called Medicare Part C.
You can also receive prescription drug coverage from other sources such as your Union, Employer Health Plan, TRICARE for Life, or the Veterans Affairs (VA). Medicare Part A - Medicare Part A provides hospital or inpatient coverage. You may pay a deductible, co-payment, or co-insurance (percentage of cost) for care under Medicare Part A. Most people receive Part A without paying a monthly premium because they (or their spouse) have been working (and paying Medicare taxes) for more than 10 years. If you have Medicare Part A, it will be printed on your red, white, and blue Medicare card. Medicare Part A may cover prescription medications during inpatient care. Medicare Part B - Medicare Part B provides coverage of doctor visits and outpatient care. You may pay a deductible, co-payment, or co-insurance (percentage of cost) for care under Medicare Part B. You will pay a monthly premium for Medicare Part B coverage (unless you receive some form of financial assistance such as Medicaid). Medicare Part B may pay for some medications that are administered in a doctor's office or by a healthcare provider - but, usually not for self-administered prescriptions. If you have Medicare Part B, it will be printed on your red, white, and blue Medicare card. Medicare Part B should cover vaccinations such as Flu shots. Medicare Part C - Medicare Advantage plans are also considered Medicare Part C plans and provide Medicare Part A and Medicare Part B coverage from private insurance companies. Medicare Advantage plans can come with prescription drug coverage (MAPD) or without prescription drug coverage (MA). Important: Warning: If you join a Medicare Advantage MA plan (Medicare Advantage plan without drug coverage), you may not be allowed to also join a separate Medicare Part D plan. Monthly premiums for Medicare Advantage plan may be $0 or range to $150+ per month - and it is possible that a Medicare Advantage plan will have a monthly premium that is actually less than $0 (the Medicare Advantage plan actually pays you a dividend or rebate on your Medicare Part B premium). Remember: Medicare Advantage plans are not the same as Medicare Supplements. Medicare Part D - Medicare Part D plans provide prescription drug coverage and may be stand-alone Medicare Part D prescription drug plans (PDP) or Medicare Advantage plans that include prescription drug coverage (MAPD). Medicare Part D is provided by private insurance companies. Monthly premiums for stand-alone Medicare Part D plans (PDPs) may range from $10+ to around $180 per month. Are all prescription drugs covered by Medicare Part D prescription drug plans? No. Medicare Part D plans are not required to cover all other prescription drugs - but instead are only required to cover a fixed number of drugs in different therapeutic drug classes. The medications covered by a Medicare Part D plan are organized in a formulary or drug list and this list must cover at least two drugs in each drug category and all drugs (with a few exceptions) in the six therapeutic categories: antidepressants, antispychotics, anticonvulsants (drugs to preventseizures), antiretrovirals (drugs to treat HIV/AIDS), immunosuppressants, and antineoplastics(cancer drugs). How many different drugs does a Medicare Part D plan cover? Each Medicare Part D plan will cover a different number of prescription drugs. In general, a Medicare Part D plan may include several thousand medications in different forms (for instance, 10mg, 20mg, and 40mg Advair Diskus MIS 250/50). Medicare Part D plans also cover vaccinations not covered by Medicare Part B (such as the Shingles Vaccine). Each year, a Medicare drug plan can change the plan's formulary. However, Medicare Part D Medicare Part D plans are regulated by the Centers for Medicare and Medicaid Services (CMS) and CMS must approve a Medicare plan's formulary or drug list every year. Are any medications excluded from every Medicare Part D plan? Yes. Some prescription drugs are excluded from the Medicare Part D program by law (such as drugs for weight loss, erectile dysfunction, cosmetic purposes, or hair growth) - however, it is possible that you plan may provide supplemental coverage of these non-Part D drugs as "Bonus Drugs". Tip: You can see all drugs covered by a particular Medicare plan by using our Q1Medicare Formulary Browser, you can change the name of the Medicare Part D plan and state to browse other formularies. You can also browse all Medicare Part D plans in a certain area that cover a specific medication - and at what cost using our Q1Medicare Drug Finder tool (found at Q1Rx.com). If you are receiving prescription drug coverage from your employer, the key is to ensure that any Employer Health Plan provides "creditable" prescription drug coverage so that you avoid any Late-Enrollment penalties. If I have employer drug coverage can I also join a Medicare Part D drug plan? Probably not. Warning: If you have an employer health plan that includes prescription drug coverage - and then enroll in a Medicare Part D plan, you risk losing all of your employer health plan coverage, not just drug coverage. You can click here to read more in our Frequently Asked Questions about checking with your employer health plan administrator before enrolling in a Medicare prescription drug plan. If I have drug coverage through the Veterans Affairs (VA) can I join a Medicare Part D plan? Yes. If you have VA coverage (that is, prescription drug coverage as part of Veterans Affairs benefits), then you may not need Medicare Part D coverage. However, if you find that the VA does not cover all of your medication needs, you can also enroll in a Medicare Part D program. The two programs actually work together, allowing coordinated coverage - first under the VA and secondly under your Medicare Part D plan. Your VA coverage is also considered "creditable coverage" and should you decide to enroll into such a Medicare Part D plan after the close of your initial enrollment period, there will be no penalty for late enrollment. You can click here to read more in our VA section of Frequently Asked Questions. Am I required to join a Medicare Part D plan? No. The Medicare Part D program is voluntary and you are not required to enroll into a Medicare Part D plan when you first become eligible for Medicare? However, if you do not have some other form of creditable prescription drug coverage and then later decide to join a Part D plan (PDP or MAPD) you may incur a permanent late-enrollment penalty that you will pay in addition to your monthly plan premiums. How is the Late-Enrollment Penalty calculated? Late-Enrollment Penalties are assessed when you eligible for Medicare Part D coverage, but are without some form of creditable drug coverage for more than 63 days. You can click here to read more in our late-enrollment premium penalty section of Frequently Asked Questions. Late-enrollment penalties are permanent and can change (increase) year-to-year. You will pay 1% of the national base Medicare Part D premium (about $35) for every month that you were without some creditable prescription drug coverage before you enrolled in a Medicare Part D plan. So if you were eligible for Medicare when you were 65 and now you are 70, you would pay 60 months worth of penalty (5 years * 12) or about 60% of the annual base premium (so around $35 * .6 = $21 per month in addition to your monthly Part D plan premium). How your Medicare prescription drug plan works: Your Medicare Part D plan coverage is divided into four parts or phases. (1) The Initial Deductible phase is where you pay 100% of your retail drug costs until you reach your deductible amount (for instance, the 2019 standard initial deductible is $415). Many people will enroll in a Medicare prescription drug plan with a $0 deductible and effectively skip-over this first "deductible" phase. Also, some Medicare Part D plans will exclude less-expensive drugs (such as Tier 1 generics) from the plan's initial deductible, so it is possible that you may have coverage for some low-costing drugs even though you have not met your plan's initial deductible. (2) The Initial Coverage Phase is where you and your Medicare Part D plan will share in the cost of your medication purchases based on your plan's cost-sharing (such as a $30 co-payment or 25% co-insurance). When the retail value of your drug purchases exceeds your Initial Coverage Limit (ICL or Donut Hole entry point), you will leave your Initial Coverage Phase and enter the Coverage Gap or Donut Hole. Please note that the Initial Coverage Limit is not measured by what you have spent on medications. Instead, the ICL is the total retail value of your prescription drug purchases. So the ICL is the amount that you pay for your prescriptions plus what your Medicare Part D plan is paying. The 2019 ICL is $3,820. As reference, the ICL in 2015 was $2,960, $3,310 in 2016, $3,700 in 2017, and $3,750 in 2018. For example, if you fill a $100 prescription in 2019 and you pay a $30 co-pay (the Medicare Part D plan pays the other $70), the total $100 retail cost is credited toward your 2019 Initial Coverage Limit of $3,820. In this case, after the $100 drug purchase, you have $3,720 remaining in drug purchases before entering the 2019 Donut Hole or Coverage Gap. For instance, in 2019, you will received a 75% discount on brand-name drugs and a 63% discount on generic drugs (you will pay 25% of your plan's negotiated retail cost for brand-name prescriptions and 37% of the retail cost for generics). As a comparison, in 2017, you received a 60% discount on brand-name drugs and a 49% discount on generic drugs (you paid 40% of your plan's negotiated retail cost for brand-name prescriptions and 51% of the retail cost for generics). The Donut Hole will be reduced to a fixed 25% co-insurance cost-sharing structure for both generics and brand-name drugs by 2020. You can read more about the current Donut Hole Discount here: https://Q1FAQ.com/470.html. (4) The Catastrophic Coverage Phase is the last phase of your Medicare Part D plan coverage and you enter once your total out-of-pocket drug costs (or TrOOP) exceed a certain point (over $5,100 in 2019). 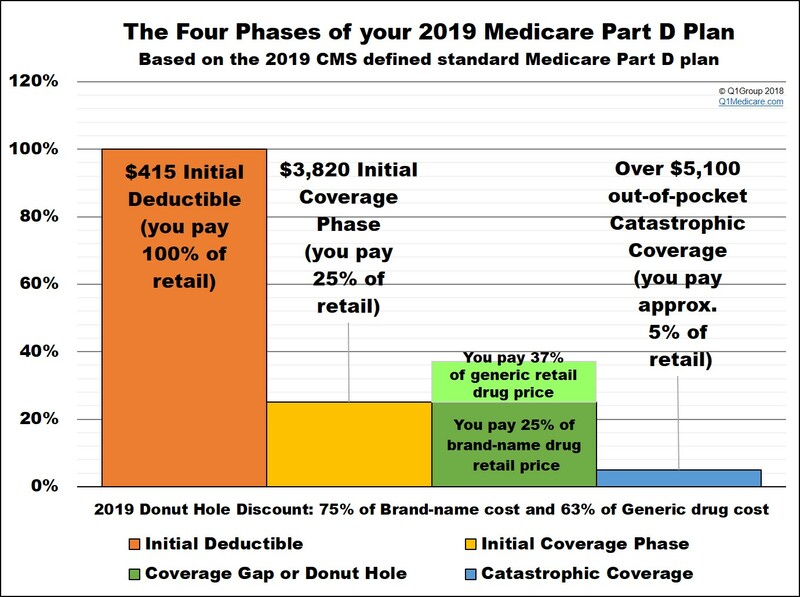 During this phase you will exit the Donut Hole or Coverage Gap and will receive your medications at a low-fixed price, paying a maximum of 5% of the retail price for the remainder of the year. TrOOP is what you have spent out of pocket for medications, but does not include your monthly premiums. Also, although you receive a 75% discount on brand-name drugs in the 2019 Donut Hole (you pay 25% of retail), you will actually get 95% of the retail price credited toward your TrOOP. When can I enroll into a Medicare Part D plan? Your Initial Enrollment Period: If you are new to Medicare, you have an Initial Enrollment Period (IEP) that is a seven (7) month window beginning three (3) months before your month of eligibility, plus the month of eligibility, and ends three (3) months after your month of eligibility. If you enroll in the three months prior to your month of Medicare eligibility, your effective date (when your plan coverage begins) is the 1st day of your month of Medicare eligibility. If you enroll into a Medicare Part D plan during your month of eligibility (such as when you turn 65) or during the three months following the month of Medicare eligibility, your Medicare Part D plan will be effective on the 1st day of the month following receipt of your plan enrollment. The Annual Enrollment Period: If you are already eligible for Medicare, you can change Medicare plans during the Annual Enrollment Period (AEP). The Annual Enrollment Period starts each year on October 15th and continues through December 7th with your Medicare Part D plan becoming effective on January 1st of the new plan year. This time period can also be called the annual Open Enrollment Period -- which is still referred to as "AEP". Special Enrollment Periods: If you are outside of your IEP or AEP, then you will need to use a Special Enrollment Period (SEP) to change Medicare Part D or Medicare Advantage plans. An SEP may be granted when you move outside of your plan's Service Area (move to another state) or move into an assisted living facility or when you qualify for Extra Help. If you are entitled to an SEP, your Medicare Part D plan will become effective on 1st day of the month following the receipt of your enrollment. See our Special Enrollment Period FAQ for more details and examples of SEPs. If you join a Medicare Part D prescription drug plan, you will pay a monthly premium ranging from only a few dollars up to over 100 dollars. If you join a Medicare Advantage plan, you may have a $0 premium - and, depending on the MAPD, may actually get a portion of your Medicare Part B premium rebated back to you (a "dividend" plan). Your monthly premiums will vary depending on the benefits of your selected Medicare Part D plan or Medicare Advantage plan and your resident state. You can see a list of all Medicare Part D plans in your state using our Medicare Part D Plan Finder (PDP-Finder.com/FL). You can see a list of all Medicare Advantage plan in your ZIP Code region using our Medicare Advantage Plan Finder (MA-Finder.com/90210). You can also learn about the Medicare Part D plan premiums in your area by calling Medicare at 1-800-633-4227. (2) Your prescription drug costs. As mentioned, your coverage costs can change depending on the phases of your Medicare Part D plan. In the Initial Deductible, you will pay 100% of your retail drug costs. In the Initial Coverage phase, you will share the cost with your drug plan (for example, you pay 25% of retail or a fixed co-pay of $30 for brand-name drugs). In the Coverage Gap or Donut Hole, you will receive a discount on the retail price depending on whether you are purchasing generic drugs or brand-name drugs. In the Catastrophic Coverage phase, you will pay around 5% of the retail price for your medications. (3) Your healthcare costs - with a Medicare Advantage plan. If you join a Medicare Advantage plan that includes drug coverage (MAPD), you will receive coverage as mentioned above and you will also receive coverage for your Medicare Part A (in-patient costs) and Medicare Part B (out-patient costs), plus you may also receive additional dental, vision, health club coverage, depending on your plan. The Medicare Advantage plan coverage should be at least as good as the Original Medicare coverage provided by the government. However, Medicare Advantage plans will have a maximum out-of-pocket spending limit (MOOP), that will be around $6,700 or less - meaning that your healthcare costs will not exceed this amount for a calendar year. Is there financial assistance to help me pay my Medicare Part D prescription drug costs - and Medicare Part A or Medicare Part B costs? Yes. The Medicare Part D Extra Help program is available to help people with limited financial resources pay for their monthly premiums and drug costs. The Extra Help or Low-Income Subsidy (LIS) program is based on a Medicare beneficiary’s income and assets (or financial resources). For more information, please contact your state Medicaid office. Medicare Savings Programs are also available and, depending on your finances, may help pay Medicare Part A and/or Medicare Part B premiums, and maybe some Medicare Part B costs. Can a Medicare Part D plan change every year? Yes. Important: Please note that Medicare Part D and Medicare Advantage plans change each year. For example, if you are eligible for Medicare in 2019, the Medicare Part D plans that you reviewed in 2017 or 2018, may not be available to you in 2019. If you find that a Medicare plan is available next year, the plans can (and probably will) have different costs, coverage, and healthcare providers. 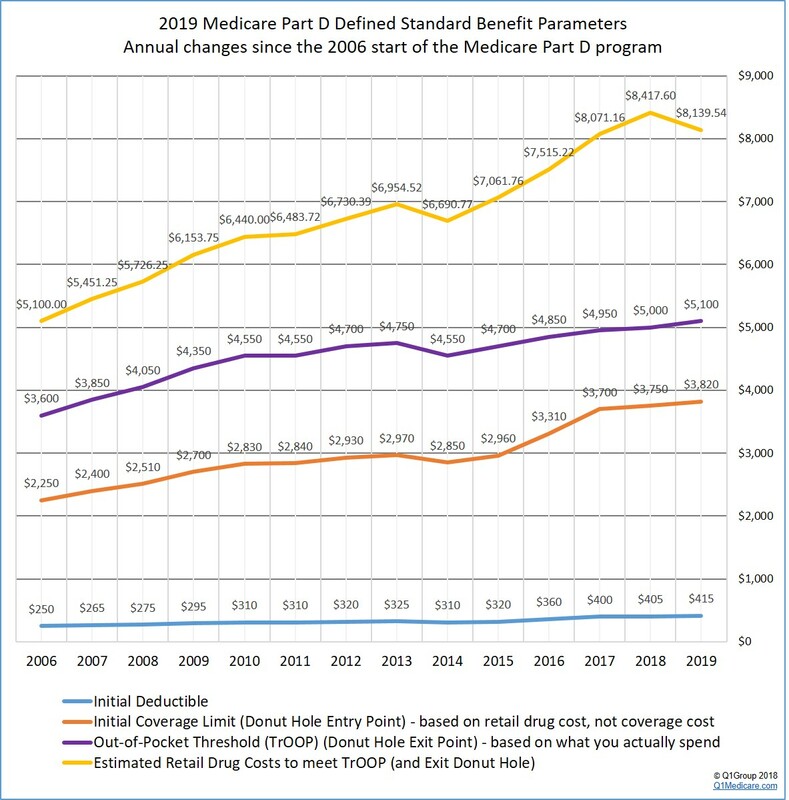 As an example, this graph shows the changing Medicare Part D plan parameters since the beginning of the Medicare Part D program. Bottom Line: Be prepared to review your Medicare plan options each year to ensure the most economic and complete coverage. Are all Medicare Part D plans about the same and available everywhere? No. Medicare Part D coverage will vary plan-to-plan and not all Medicare plans are available in all areas of the country. Remember: Medicare Part D and Medicare Advantage plans are offered in specific Service Areas, such as multiple-states, counties, ZIP Code areas, or parts of a highly-populated city such as New York or Los Angeles. This means: If you live in Saint Johns County, Florida, you will not have the same selection of Medicare plans as your friends who live in Orange County, California. Our Q1Medicare.com tools are designed to provide people with an overview of all Medicare plan options in their area or region. How do we choose a Medicare Part D or Medicare Advantage plan? There is no one "right" way to choose a Medicare Part D or Medicare Advantage plan. In general, we simply advise people to choose a Medicare plan that most economically covers their current health and prescription needs. The Centers for Medicare and Medicaid Services (1-800-Medicare) suggest that you look at the factors of Coverage, Cost, and Convenience - to these criteria we also add that you should probably consider the Company and your level of Comfort. Coverage - Ask yourself: Are your prescription medications covered by this plan? Are there low-costing generic alternatives for your brand-name drugs? Can you work with this plan to get a formulary exception should you need a medication that is not covered on the existing formulary? How large (generous) is the Part D plan's formulary or drug list? What formulary price-tiers apply to your medications ($30 co-pay or 33% of retail)? What health coverage does the Medicare Advantage plan offer beyond basic Medicare? What is the Medicare Advantage plan's maximum out-of-pocket limit (MOOP)? Are there any additional coverage benefits offered by the plan? Cost - What are the monthly plan premiums? Does the Medicare Part D plan or Medicare Advantage plan have an initial deductible? Are there any drug tiers excluded from the deductible that would provide immediate coverage? What are the co-payments or co-insurance that you pay for your medications or healthcare? What are the plan's coverage limits? Is there any prescription coverage in the Donut Hole? Convenience - How difficult is it to find a pharmacy or a health care provider? (Note: most Medicare Part D plans now have a pharmacy network of 50,000 to over 60,000 pharmacies.) Does the Medicare Advantage plan have a restricted healthcare network? Do your doctors (hospitals) accept this Medicare Advantage plan? How easy is it to work with this Medicare Part D plan or Medicare Advantage plan when it comes to asking for Prior Authorization or exceptions to utilization management restrictions? Company - Is the company who provides the Medicare Part D or Medicare Advantage plan important to you? Often people choose a Medicare plan based only the Medicare plan provider's reputation or recommendation. Does the company have an acceptable quality star rating? But what if you do not need Medicare plan coverage? join a Medicare Advantage plan that includes drug coverage (MAPD) has a $0 (or low) monthly premium and a healthcare network that includes many local doctors and other healthcare providers. I do not use any medications at this time, but I do not want financial risk associated with a penalty or unforeseen prescription costs - what are my options? People with more complex medication or healthcare needs must spend more time ensuring that their specific needs (medical and prescription drugs) are covered by a Medicare Part D or Medicare Advantage plan. For example, if you have a particular plan in mind (such as a local Medicare Advantage HMO POS that is provided by the large university or hospital system in your area), then you can review all of the coverage details we have online - and then call the plan to learn whether their healthcare providers are included in the Medicare Advantage plan's network. Need a place to begin? On this page, you can see the name of the Medicare Part D plans, the monthly premium, the initial deductible, and the co-payment rate for the different drug tiers. If you wish to see the medications covered by this Medicare Part D plan, you can click on the "Browse Formulary" link on the right side of the chart. You can also click on the icons under the plan names for more plan details and plan contact information. From this Humana Walmart Rx Plan example link, you can see the medication names and packaging information, drug tier number, tier description, cost-sharing and usage management restrictions (if any). Using our Formulary Browser, you can always change the name of the Medicare Part D plan and state to browse other formularies. Again, you can see the basic coverage details of all these Medicare Advantage plans in the list, along with Medicare Part D prescription drug coverage details, if included on the plan (or MAPD). The icon below the Medicare Advantage plan name that looks like a small stack of paper will show all of the coverage details for a specific Medicare Advantage plan. If you feel lost or overwhelmed along the way, you can always contact Medicare directly at 1-800-633-4227 (1-800-Medicare), select the prescription drug option, and then choose the option to speak with a Medicare representative or say "representative" during the menu options. Once connected, you can explain your situation to a Medicare representative and ask them to help you find a Medicare Advantage plan or Medicare Part D prescription drug plan that most economically covers your health and medication needs - or you can ask specific questions about a particular Medicare plan or the Medicare Part D program in general. If you find a suitable Medicare Advantage plan or Medicare Part D plan and are eligible to enroll into the plan, the Medicare representative can process your enrollment into your chosen Medicare plan directly over the telephone - and the process only takes a few minutes. A Medicare representative is not compensated for a Medicare plan enrollment and provides you with an unbiased view of all available Medicare Part D plans or Medicare Advantage plans.